In September 1945 Pest Control Ltd had discussed the last possibility with Cierva and the W.11 design was modified to meet this role. As a result, Cierva received a development contract for one W.11 in July 1946, drafted to Specification E.19/46, and a second was ordered in early 1947. Cunliffe-Owen Aircraft Ltd were contracted to build the two aircraft at Southampton/Eastleigh Airport under the technical and financial control of the Cierva company. 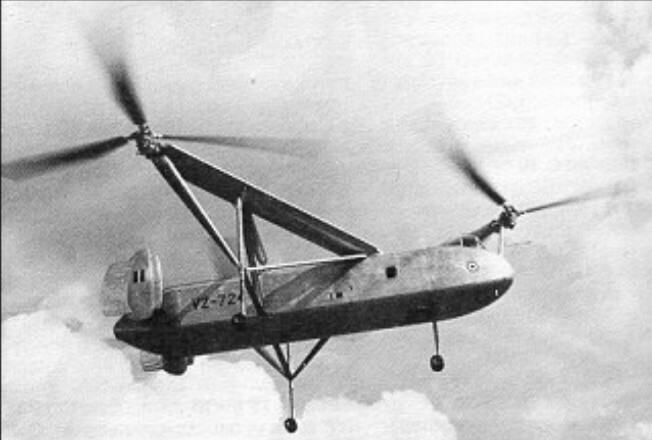 The Cierva W.11 Air Horse, built in 1948, featured three tri-bladed rotors mounted on outriggers from the fuselage and driven from a centrally-installed engine. Two prototypes were built for the British Ministry of Supply. Power from a single Rolls-Royce Merlin 24 engine of 1208kW was transmitted through shafting to three-bladed rotors mounted on outriggers, each at the tip of a triangle. All three turned in the same direction, but their plane of rotation was sufficiently tilted to compensate for torque. Each rotor hub had a control spider which ensured cyclic and collective pitch control. The engine with its distribution gearbox to drive the rotors was situated just behind the cockpit in the fuselage. The fuselage was designed to carry twenty-four passengers in a compartment measuring 5.79 x 2.31 x 1.77 metres. There was a tricycle landing gear, each leg of which was fitted with an oleo-pneumatic shock absorber. Twin fins were carried at the end of a mid-mounted tailplane on the rear fuselage and there was accommodation for a crew of three. The prototype, the largest in the world at that date, made its maiden flight on 7 December 1948, but shortly after being displayed at the Farnborough Show it crashed, and work did not start on it again until the Gierva Company was taken over by Saunders Roe. The Colonial Office made a grant of GBP45,000 to assist in the development costs since the type offered prospects of overseas use in the spraying role (total Ministry of Supply development costs were estimated at GBP350,000), but before the second W.11 had flown the first crashed on 13 June 1950, killing the three flight test crew members; the second W.11 never flew and was scrapped in 1960. The designation W.11T was allocated to a project for an enlarged W.11 with two 1208kW Rolls-Royce Merlin 502 engines and the W.12 was a projected freighter development with Rolls-Royce Dart turboprops. Neither of these materialised since by that time Cierva, not having used the number W.13, was involved in development of the W.14 which became the Skeeter and was built by Saunders-Roe Ltd.